If You Seek the Dead, What Happens to Your Life? The above photo is one of my favorite anomalous pictures. There is something so melancholy, so desperate, so tragic in this figure’s abandoned gesture. If we are to take this as a true representation of a spirit, then there is a tremendous sadness to the afterlife, or at least to the life-in-death that this soul is experiencing day after day, year after year, decade after decade. In the previous post, I touch upon the research that defines people in search of their past lives as tending to be depressives with problems sleeping and an active imagination. Perhaps that research would say the same thing about ghost hunters or paranormal investigators. Do we tend to be depressed? Are we prone to insomnia? Do we exaggerate our findings due to lively imaginations? I have no idea; I rather doubt that we are all that different from the general population, although I would like to know what other investigators think about this issue. During the most difficult time in my life–watching my ex-husband drift away and eventually move out–I started to devour books on life after death. I had so many tomes on the spirit world that they formed a huge column by my bed. They gave me comfort, solace, for reasons that I didn’t understand at the time. Now, when my life is stressful or sad or difficult, I still turn to those tomes–although now, I am choosing to disentangle difficult theories that seek to add scientific backbone to the quest for the afterlife. However, perhaps the emotion that drives this passion of mine is the same as it was then–an unresolved depression and dissatisfaction with the circumstances of my current life. I am not unhappy with my family or my job–quite the contrary–but I have emotional wounds that never healed from years, decades ago. Is it that pain that drives the obsession with life after death? Am I thinking, albeit not always consciously, that the next life will be better? Do I hope for enlightenment and optimism after the transition? I think it’s a valid question for all of us who work in this field or find ourselves tracking ghosts with fervor. Do we do this because we hope to find something to inspire us in the next life? Is there angst and sadness that we work out through the spirit world? Of course, I don’t mean to suggest that this is the case for everyone, or even the majority–but I have to wonder. Contemplating the above picture, I start to think that perhaps the afterlife is only a reflection of our current life, and that any thought of future happiness in the spirit world is doomed to failure if we don’t find that happiness in the here and now. As we sow, so shall we reap. If we see through a glass darkly now, that glass will become none the clearer after we exit this world and enter the next. Reincarnation Memories Due to a “Source Monitoring Error”? “People who believe they have lived past lives as, say, Indian princesses or battlefield commanders are more likely to make certain types of memory errors, according to a new study. The propensity to make these mistakes could, in part, explain why people cling to implausible reincarnation claims in the first place. Researchers recruited people who, after undergoing hypnotic therapy, had come to believe that they had past lives. Subjects were asked to read aloud a list of 40 non-famous names, and then, after a two-hour wait, told that they were going to see a list consisting of three types of names: non-famous names they had already seen (from the earlier list), famous names, and names of non-famous people that they had not previously seen. Their task was to identify which names were famous. 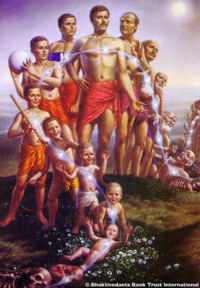 The researchers found that, compared to control subjects who dismissed the idea of reincarnation, past-life believers were almost twice as likely to misidentify names. In particular, their tendency was to wrongly identify as famous the non-famous names they had seen in the first task. This kind of error, called a source-monitoring error, indicates that a person has difficulty recognizing where a memory came from. People who are likely to make these kinds of errors might end up convincing themselves of things that aren’t true, said lead researcher Maarten Peters of Maastricht University in The Netherlands. When people who are prone to making these mistakes undergo hypnosis and are repeatedly asked to talk about a potential idea — like a past life — they might, as they grow more familiar with it, eventually convert the idea into a full-blown false memory. This is because they can’t distinguish between things that have really happened and things that have been suggested to them, Peters told LiveScience. Past life memories are not the only type of implausible memories that have been studied in this manner. Richard McNally, a clinical psychologist at Harvard University, has found that self-proclaimed alien abductees are also twice as likely to commit source monitoring errors. As for what might make people more prone to committing such errors to begin with, McNally says that it could be the byproduct of especially vivid imagery skills. He has found that people who commonly make source-monitoring errors respond to and imagine experiences more strongly than the average person, and they also tend to be more creative. “It might be harder to discriminate between a vivid image that you’d generated yourself and the memory of a perception of something you actually saw,” he said in a telephone interview. OK, I can certainly accept that adults who undergo hypnosis seeking past-life answers to current predicaments are prone to be creative thinkers more open to suggestion than the average person. “Vivid imagergy skills” and “suggestibility” indicating difficulty recognizing where a memory comes from are pitfals for the past life seeker, but certainly not any kind of refutation of the theory itself. Adults who seek to uncover who they were in a past life are walking into a minefield if they hope to prove to themselves or anyone else that what they “remember” is actually originating in a past existence. By the time we are adults, our memories are so crowded with information that it is virtually impossible to “prove” that our memories represent objective recollections of an actual past life; even if we could locate the history of the person that we claim to have been, there is no way to know for sure that the information we possess didn’t come from a written or oral source that we glanced over or heard in passing. That information can bypass conscious awareness and lodge itself in the unconscious brain, only to be brought out under hypnosis as an experience we believe we had before. Then, of course, we have to understand how our unconscious wishes, desires and repressed emotions play a role in the past life we might create for ourselves. We can’t forget the influence of our experiences, fears and fantasies that might not be adequately expressed in a conscious state. For all of those reasons, the most important researchers in reincarnation memories–the late Dr. Ian Stevenson and the current Dr. Jim Tucker–discount adult memories of reincarnation as impossible to corroborate. Note that this does NOT mean that such past lives did NOT exist; simply that to prove their existence scienfically is a daunting and probably pointless task, since the contamination of our present lives cannot be excluded from our memories of a past as someone else. There is no “pure” adult who can claim that he/she was not exposed to information about the person he/she claims to have been decades or centuries ago. That is why reputable past life research focuses on children’s past life memories, since children have not had the opportunity at the age of four to have read some obscure article with information on the person they used to be. Also, children’s past life memories are not coming from the rational, conscious brain that fabricates other lives based on a wealth of information that the adult has collected over decades; children show behavioral traits, emotional characteristics, that are out of synch with who they are now. A parent knows when her child is behaving in ways that are beyond what is logical or understandable for their age. An adult, on the other hand, can be anyone he chooses to be, or needs to be. What really interests me about the above aricle is the statement that “people with implausible memories are also more likely to be depressed and to experience sleep problems”. I want to explore in more depth the possible reasons for that, and what someone interested in such research should do BEFORE he or she decides to embark upon the regression journey. There should be a sign posted at the entryway to the hypnotist’s office: “BEWARE: do not seek answers in the past that require solutions in the present”. More on this later . . .